Our series continues as we look around the new Central Division. We’ve already looked ahead at one new addition, the Winnipeg Jets, and an old rival, the St. Louis Blues. Now, let’s look at the Nashville Predators. To say the last 14 months have been disappointing in Nashville is an understatement. They finished the 2011-12 season with 104 points, in second place in the division and fourth in the Western Conference (but third in points). But Ryan Suter leaving for Minnesota and a series of injuries dragged the Preds to 14th in the Western Conference with only 41 points (16-23-9). Only the Florida Panthers (15) won fewer games than the Predators last year. The Preds offense was pathetic last year. They finished tied with Florida for the fewest goals scored in the league last year, averaging only 2.27 per game. While Nashville has never been accused of being a high-scoring team, their defense and goaltending has always compensated for their average-at-best offensive output. Last year, however, the Preds allowed 2.77 goals per game, ranking 20th in the league. Those numbers aren’t good enough for a team to contend for a playoff spot, whether they’re competing in a six or four-division format. Such a sudden descent leads to two realities for any franchise: questions about the team’s future, and draft choices high enough to add faces to answer some of those questions. 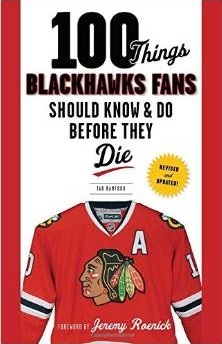 Thankfully, the Preds have a couple faces coming that could help sell tickets – whether they’re trying to rip off Blackhawks fans or not. Forsberg, who turned 19 last week, was the 11th overall pick by Washington in the 2011 Draft. A highly regarded center who had spent three years with Leksands IF in Sweden, he played in five games for the Preds last year. He could emerge as one of the new faces of a rejuvenated group of forwards in Nashville. Defenseman Shea Weber led all Predators with 28 points, and only three players reached double-digits in goals last season. One of those three was 22-year-old Gabriel Bourque, a fifth round pick of the Preds in 2009. In 77 games over two NHL seasons, Bourque has scored 18 goals with 17 assists. Forsberg, Bourque and free agent addition Viktor Stalberg add speed to the forward lines that Nashville hasn’t enjoyed in years (if ever). Stalberg, 27, signed a four-year, $12M deal after seeing his ice time disappear with the Blackhawks in the postseason. Another player the Preds hope to lead their young core is Colin Wilson. Wilson, the seventh overall pick in the 2008 Draft, was having his best season – seven goals and 12 assists – in 25 games before a shoulder injury ended his season prematurely. He’ll turn 24 in late-October and the team is hoping for continued growth from him. Stalberg wasn’t the only significant free agent forward added by the Preds this summer. Veteran center Matt Cullen, who had 27 points and won 54.7 percent of his faceoffs with the Wild last season, signed a two-year, $7M deal and gives Nashville a very good, deep group of centers. Cullen, David Legwand – who led Nashville with 12 goals last year – Mike Fisher and Paul Gaustad give Nashville four centers that are capable of winning over 50 percent of their faceoffs, and Forsberg could add an offensive element to the position as well. 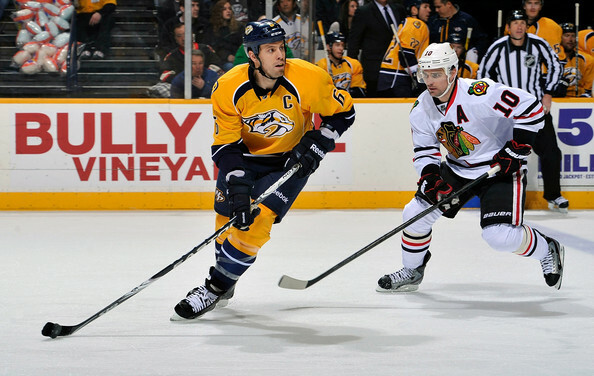 Nashville also added some veteran grit up front with Matt Hendricks and Eric Nystrom. One significant subtraction from the lineup is the headache known as Sergei Kostitsyn, who has left for the KHL. While the forward group is where much of the attention – and financial resources – were focused since the trade deadline, the blue line might be where the most intrigue rests looking at the coming season in Nashville. There might not have been a happier GM at the 2013 Draft than David Poile, who was summoning every bit of positive mojo/juju/luck/karma in hopes that one player would “fall” to the fourth overall pick. 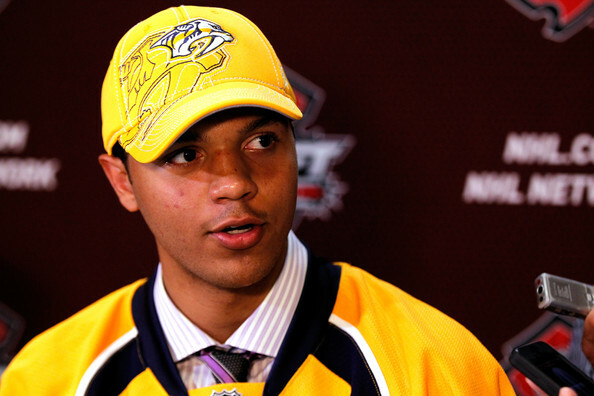 Nashville sprinted to the podium and selected the 6-4, 205-pound defenseman who was considered by many to be the top prospect in the highly-touted 2013 class. Jones might be the most notable addition to the blue line in Nashville, but another name might make the biggest difference. The Predators added Hall of Fame defenseman Phil Housley to their coaching staff this summer as well. Housley coached of the US National Junior Team that won the gold medal at the 2013 World Junior Championships in January, and ranks fourth all-time in regular season points (1,232) among all NHL defensemen. Housley will take over a group led by the team’s captain, Weber, but that also has some exciting young players other than Jones. Roman Josi had 18 points – more than Kostitsyn or Craig Smith – while averaging 23:31 per night last season. Ryan Ellis, the 11th overall pick in the 2009 Draft, is expected to take the next step while veteran Kevin Klein will likely continue averaging over 20 minutes per game. Filling out the blue line for the Preds will likely be rookie Mattias Ekholm, the team’s fourth round pick 2009. Ekholm, 23, is already listed at 6-4 and 205 pounds, and had 10 goals and 22 assists in 59 games with Nashville’s AHL affiliate in Milwaukee last year. While there are youngsters joining veterans all over the ice for Nashville next season, perhaps the most eyes will be on the man between the pipes. Pekka Rinne had a career-worst .905 save percentage last season, and had hip surgery in early May. He’ll be backed up by former IceHogs goaltender Carter Hutton, but clearly the success (or failure) of the 2013-14 Predators relies more on Rinne’s health than on the number of Jones jerseys sold or tickets to multiple games they can force Chicagoans to buy. Barry Trotz is a damn good coach. His teams are the epitome of the sum being greater than the parts. I think last season was the anomaly and this season will see the Preds back get back to what we have come to expect from them, namely stellar goaltending and defence and grind it out hockey. The loss of Suter had a dramatic effect on the overall team defence and while it was generally thought the Suter played Robin to Weber’s Batman, I’m not so sure but if it wasn’t the other way around. I don’t know how effective Seth Jones will be as an 18/19 year old, but the d-corps has now had a season to acclimate to life without Suter so they should be better. With the defence in front of him playing better, there’s no reason to think Rinne won’t return to his top-5 form. Cullen can still play pretty well and should fit in nicely with Trotz’ system. The loss of Kostitsyn is addition by subtraction. And although he always seemed to score against the Hawks, Erat was just a middle of the road player who should be easily replaced with Forsberg and Stalberg. I will be surprized if the Preds are not in thick of the playoff race and will again be one of those teams that you hate to face in the playoffs. a lot of young talent and speed is there- just need a couple of more years. I like the Preds to rebound BIG this season. I’m very curious to see Seth Jones up close and personal. I think Fla, Tampa, and Col made huge mistakes passing on Jones. I like their defense and like their new additions. However if Rinne is hurt that could derail the team right out of the gate. Few teams count on their goaltender more then Nashville does. I’m also very curious to see Forsberg he has ALOT of upside according to most scouts. From a fantasy hockey perspective there is a lot of dynamic players outside of Rinne and Weber. Roman Josi might be worth a late round selection. I see a team getting younger, but with no guarantees of solving their scoring issues…and I see an overworked goalie coming off hip surgery, so I don’t buy into the thought that says they will rebound this year…Trotz is a good coach, and he will get this team to play responsibly, but unless as Tab said, their goaltending stands on its proverbial head, the Preds are a .500 hockey team. Stahlberg will give them speed and some excellent backchecking potential, but he isn’t their answer for scoring…as much as I liked Stahlberg while he was a Hawk, he possessed hands of stone…which is not what the Preds need at all. Stalberg, much like Kopecky, is a role player with skills that benefit from playing around great players on a deep team. The quick development of their youngsters is key for Nashville getting back into the mix in the Western Conference. If Forsberg & Jones can step into prominent roles and make an impact this year, they’re on the right track. Cullen was a great pick up. I think he took the money (which i am not blaming him for) rather than sign with a legitimate Cup threat. The Wild will miss him. The Preds are a year away from a rebound. They will play decent hockey. They will have a nights where they find the back of the net 4 times and look like the top 15 team, and then they will have stretches where they look horrible and despite playing response defense they will struggle to win games. While they aren’t bad, the truth is, they aren’t that good… yet. As tab said, if Forsberg and Jones come in and step up, they could be primed to rebuild really quickly. Preds look like the 2007-08 Blackhawks a little to me… if the pieces can come together and a couple guys take the next step, they could have a start of something nice down there.